Special Order Item from mfg. if available. Counterweighted base for smoother rolling. 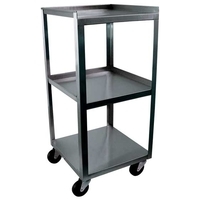 Made of polished stainless steel construction with 3 shelves. The welded construction has a double thick 16 gauge legs with heavy duty 22 gauge shelves. 200 lb. total weight capacity. Dimensions:14"W x 14"D x 30"H (35.5cm x 35.5cm x 76.2cm).